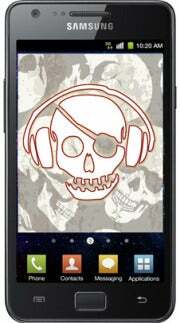 Google is taking an inconsistent stance on allowing apps that enable music piracy via smartphones to remain available in its Android Market. The muddled position comes just as Google readies its launch of a Google music store. Google has "refused" to remove MP3 Music Download Pro, a popular app for downloading copyrighted music from the Android Market, according to the Recording Industry Association of America. The RIAA told PC Magazine that it sent Google a takedown notice for the app in August, and Google refused to take action. Other similar apps, such as Easy MP3 Downloader and MP3 Music Download Super, are also available through the Android Market. MP3 Music Download Pro sniffs out songs from the Web's dark corners and makes them available for streaming or download. It is currently the forth most popular Android app, according to Google's Android Market. The sources of the music, scattered throughout countless domains, are hidden unless the user decides to share the download link with other people. The app doesn't indicate that downloading songs from these sources is illegal. Google has apparently decided that MP3 Music Download Pro and similar apps will stay. But in the past, Google has ejected apps similar apps from the Android Market, including Music Junk, Music Wizard, and Music Zilla. Google has also removed Grooveshark, a streaming music app that at least had licensing deals with some labels. "We were surprised by Google’s removal of the Grooveshark App from the Android Market Place, and are still unclear as to what policies have now been violated," Grooveshark said in April. 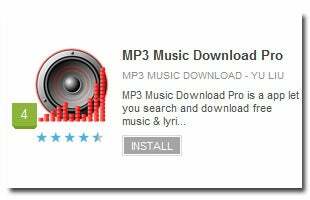 Citing "industry sources," PC Magazine noted that MP3 Music Download Pro may be allowed to stay because it can also be used to find music from legitimate sources. But that argument applies to most sources of infringing content, and it hasn't stopped U.S. courts from shutting down services that mostly deal in copyrighted songs, such as Limewire. Even when Google does take down music piracy apps, the company doesn't actively prevent new apps from cropping up. The RIAA admitted this in September, noting that "too often we see the same or substantially similar apps from the same developers reappear a few days later." In the end, Google doesn't want to start actively monitoring the Android Market. Although Google reserves the right to remove infringing apps, its developer agreement says the company "does not intend, and does not undertake, to monitor the Products or their content." If Google started playing gatekeeper, it would ruin the open spirit of the Android Market. But by acting sporadically, Google sends mixed messages that are sure to rile up the music industry. That can't be helpful as Google tries to negotiate a legitimate music store of its own.